Traditional Hair Replacement methods why only 1800 – 2300 grafts per session? 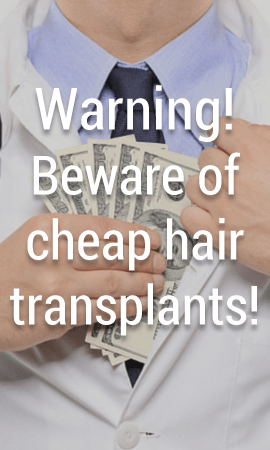 Clinics generally only transplant an average of between 1800 and 2300 hair grafts hairs in one session because they have two very good reasons. The first and most vital reason is because the conventional scalpel 'slit' technique used for re-implantation of the hairs physically cannot achieve super-high density proximity without the risk of graft strangulation and failed hair growth as a result. More about this later as you read on. The second reason is commercial; the average Micro surgery 'slit' grafting patient will have to return to the clinic for a 2nd and possibly a 3rd thickening-up session at 6 to 8 monthly intervals. For those with greater loss of hair or those who want to achieve the highest density of hair possible, they will have to return for a 3rd or ever a 4th session, again usually with intervals of between 6 and 8 months in between sessions. This assures the clinic of a continuous flow of patients to 'pad out' their throughput of new patients and without having to increase staffing levels. There are only two methods that we'll talk about regarding donor hair extraction because in advanced modern hair replacement surgery we're going to only concentrate up Follicular Unit Extraction and the Strip Removal Methods. The only difference between the two methods is the method of harvesting the donor hair. F.U.E. uses a tiny punch that removes the hair and the root from the scalp. The HDHT clinic's skilled surgeon has also refined the technique still further so the risk of scarring is also dramatically reduced to a similar level as the strip removal method. Strip extraction removes the donor hair in a linear strip of appropriate length and width to achieve a satisfactory replacement. This method leaves a very fine scar under the hair and usually invisible unless the hair is worn extremely short. This method is also the most efficient in extracting the greatest amount of undamaged donor hair possible leaving minimal aesthetic damage to the donor area. As always the best way to promote the best recovery time from any cosmetic medical procedure is to minimise the invasiveness of that procedure. In other words, the less damage to the skin/hair/body that is made, the faster the recovery time will be, this is simple logic and science fact. What is Micro Surgery Scalpel Slit Grafting? With 'micro' 'slit' grafting, a scalpel is used to make the 'slits' in which to 'implant' the donor hairs into the recipient site. The size of this incision is approximately 3.5mm in diameter. The process must leave a space around each 'slit' and newly transplanted graft, equivalent to the graft size itself. Therefore the space left surrounding each graft to allow a healthy growth must also be 3.5mm. If they are planted too close together, the grafts will literally 'fight' between themselves for blood supply. This is called graft 'strangulation' and those grafts that lose the 'fight' will fail to grow. This is why every hair transplant using conventional micro surgery and 'slit' grafting on average only achieves between 1800 and 2300 implants per session. This is also the reason why any hair replacement technique performed in this way will ways require more recovery time, because there is more damage to the scalp as a result of the replacement method. The majority of conventional methods currently on offer using this technique will therefore ALWAYS need a 2nd or possibly a 3rd, or even a 4th session, at 6 to 8 month intervals in order to 'infill' the 'gaps' left by the micro surgery 'slit' technique to achieve an acceptable 'volume' result. What is the High Density Hair Transplants Needle Technique? The High Density Technique uses a needle – no surprise there. Because a 1mm fine needle is used to prepare the recipient site, there is minimum damage to the scalp and therefore recovery time is dramatically reduced to a minimum. For both F.U.E. and F.U.T. tweezers are used to re-implant the hairs into the pre-made holes. The use of tweezers with a skilled doctor is accurate, precise, fast, and the end results will be good. Because the HDHT technique uses a tiny 1mm needle patients usually leave the procedure wearing only a cap (which is provided) and in some cases a small bandage/head band to cover/protect the donor site. The perception of people leaving a hair transplant procedure with their heads completely wrapped in bandages, with significant bleeding and in pain is from the older plug surgery technique. Our patients are able to shower and shampoo their hair within days after of the hair restoration surgery and with only some very mild discomfort that is treated with oral medications, and literally no bleeding. Follicular units are roots with 1, 2, 3, 4, 5 and even 6 hair growing from them. Under powerful microscope magnification the technician identifies the multiple hair roots called 'bundles' and dissects them for transplanting without damaging their growth potential. Follicular Unit Extraction (F.U.E) and Follicular Unit Transplantation (F.U.T) will be covered together because the only difference between the two is the method of extracting the donor hair. Follicular Unit Extraction (F.U.E) and Follicular Unit Transplantation (F.U.T) techniques are a little more time consuming than the strip removal method but the results from both will still be excellent. The HDHT surgeon has refined the F.U.E technique in order to avoid completely shaving the patient's head in preparation for treatment, depending on the severity of their hair loss. The HDHT surgeon can often remove sufficient donor hair while limiting the area shaved to 2cm across the back scalp. So if the patient's hair is longer than 2cm above the shaved strip he will be able to disguise the site from day 1. The HDHT technique ensures that only healthy grafts are transplanted, and naturally healthy hair will grow naturally. Depending on the patient's donor hair density it is possible to implant 'up to 3000' grafts in one extended full day F.U.E. session. The HDHT procedure using the F.U.E technique will give you totally natural looking results with single and two hair grafts being placed along the front hairline to ensure a softer, natural looking hairline. With the larger 3, 4, 5 and even 6 hair grafts to achieve more density / volume for the patient. F.U.E. does not leave a linear scar so it may be more suitable for those wishing to wear their hair very short at a future date. F.U.E. is also beneficial for those who have, for various reasons, not healed well after the strip harvesting method or who might suffer from having a very inflexible and tight scalp. This technique can also be used to camouflage damage from a 'widened' linear donor scar hair is extracted from the area around a linear donor scar and then placed directly into it. The High Density Hair Replacement technique is THE most efficient method of re-implanting harvested donor hair back into the scalp in the desired location. The ability to resume strenuous activity almost immediately after the procedure. The lack of a linear scar at the donor site for those who want to wear their hair short. Minimum healing time in the donor area. It is possible for as many as 3,000 grafts to be re-implanted in a single session for patients with sufficient donor hair. Consequently much larger areas of baldness or areas of thinning hair can usually be treated in an extended single day session. The surgeon uses a needle only 1mm in diameter to implant the hair, allowing for much closer proximity grafting and greatly increased hair density to be achieved in a single session. Micro Surgery using a scalpel can require as much as a 3.5mm radius between the implanted hairs, therefore the mathematics are very simple. These specially prepared incisions flow in the same direction as your original natural hair growth. Enables the harvesting of finer hair in the nape of the neck which could be used in the front hairline or the eyebrows – it is therefore theoretically possible to harvest non-scalp hair. The High Density Hair Replacement strip removal and F.U.E. technique offers many significant advantages over conventional Microsurgery. These specially prepared holes flow in the same direction as your original natural hair growth. Because of the highly efficient High Density Hair Replacement technique it is possible for many thousands of hairs to be implanted during one session. It is possible for as many as between 6,000 and 7,200 hairs to be re-implanted in a single session for patients with sufficient donor hair. Consequently much larger areas of baldness or areas of thinning hair can usually be treated in only a few hours and in a single session. Similar density and volume of hair could often only be achieved by any of our competitors over as many as 3 costly sessions spread over an 18 month period based upon an average of 6 monthly intervals in between sessions.